19TH January, 1972, West Bengal. * Diploma in wood Work 1994 Silpa Shadan, Sriniketan, Visva-Bharati. 1. Worked as Lecturer in College of Art & Design, Burdwan University, W.B., India. 2. 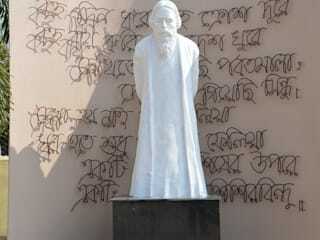 Assistant professor- Visva-Bharati University, Santiniketan. 1. Merit Scholarship from Visva-Bharati, 1994, 1995, 1996, 1997, 1998, 1999, 2000. 1. Diploma of Outstanding award in Beijing Olympic park city sculpture design competition - 2006 organized by Beijing municipal commission of urban planning , Beijing municipal cultural bureau and Cultural and ceremonies department of Beijing organizing committee for the games of the XXIX Olympiad –2008. 2. Awarded Artist of the year 2004, B.D.Bangur Endowment “Nirman Award, Art in Excellency”, India. 1. A performance “VODOO-GANY” 6th May, 2000 at P-2 Shop Mattershburg Judengasse, Austria - Catalogue. 2. Art Forest-2 (The Floating world) An International Permanent Exhibition in Forest – 27th May, 2000 Forchenstein, ‘Wien, Austria. – Catalogue. 3. Exhibition at Diekleine Gallery 1030, Wien, Austria, June – 2000. 4. International Exhibition – Organised by YUGOSLAVIA, AUSTRIA SOCIETY and GERMAN EMBASSY – 26th June’ 2000 in foyer Des Radio Culture House - ORF, HOFLICHST. AUSTRIA. – Catalogue. 6. Work “Splendour” admitted in 53rd Concorso internazionale Delle Ceramic d’ Arte Contemporanea, (International Competition for Contemporary Ceramic Art, 2002-2003. Museo internazionale delle Ceramiche 2002-2003 Faenza (RA) Italy. - Catalogue. 7. Lonely Planet – An permanent installation for exhibition at “Art in Landscape”- at “Gut-Gasteil” - Prigglitz, Austria – 2002, Catalogue. 8. Participated in Nomadifesta – 2004 organised by Artrageous group at Solomou Square, Kastelliotisa Space in Nicosia, Cypruss 22nd May –2004, Catalogue. 12. “The Nest” – Exhibited at Beijing Municipal Exhibition hall for Olympic park Beijing City Sculpture design Exhibition, 2006. 13. “The Wounds” selected and exhibited in China – Asean Youth Art Work Creativity Contest – 2006, Beijing. Ceramic-Sculpture at Nandan Art Gallery, Santiniketan, February 2002. 1. Group Exhibition held in Calcutta at Gorky Sadan. February 1998 – Catalogue. 2. Group Exhibition held in Bhopal at Sun Art Gallery October 1998 – Catalogue. 3. Kala-Bhavana Annual Exhibition 1994, 1995, 1996, 1997, 1998, 1999, 2000, and 2001. 4. Group Exhibition held in ABC Art Gallery, Varanasi, February 2000 – Catalogue. 5. Work Selected in Birla Academy Annual Exhibition, Calcutta, 2000. – catalogue and Annual Exhibition – Calcutta – 2001 Catalogue. 6. Work Selected in Lalit Kala Academy, 42nd National Exhibition, Jaipur & New Delhi, 2000 – Catalogue. 7. Work selected in 44th National Exhibition of Lalit Kala Academy, Delhi and Ahmadabad, 2001-02, Catalogue. 9. Group Exhibition – ENSEMBLE Govt. 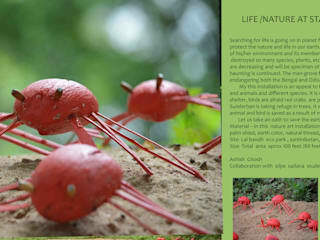 college of Arts, Chandigarh, October, Catalogue. 10. 68th All India exhibition of Art Amritsar, Catalogue. 11. A Group Exhibition “Migration-City-home” Organised by Rashtriya Lalit Kala Kendra, Kolkata and Birla Academy at Birla Academy, Kolkata. 17 .participated art fair Indian art sumit delhi 2011 delhi. 1. Seminar on Public Sphere at Santiniketan, January 2002. 2. Seminar on Public Sphere at Delhi Sanskritik Pratisthan, March 2002. 3. Dogra Camp at Kala Bhavana, 1997, 1998. 5. Sculpture Camp : Lalbahadur Shastri National Academy of Administration Govt. of India, Mussoorie, July 1999. 6. Sculpture Camp of Ambuja Housing Development Ltd. at Calcutta – April - 2000. 7. Participated in All India Artist Camp, Seminar of Lalit Kala Sansthan, Dr. B.R. Ambedkar University Agra, February, 2002. 8. Participated in Sculpture Camp Organized by Rashtrya Lalit Kala Kendra, Kolkata and Manipur Sate Museum at Imphal in January 2003. 9. Participated in the work-shop “PALASH – 04” AT RANCHI, Organized by Chhotonagpur Art Research & Development Society, Ranchi, Jharkhand, 7th May 2004 to 9th May 2004. 10. Invited to Demonstrate and Deliver Lecture on Ceramics at Bhubaneswar, Orrissa, March 2005. Organized by Rastriya Lalit Kala Kendra, Bhubaneswar. 11. Participated in Art camp of E.M.E. – A.W.W.A organized by Panchali at Fort William, Kolkata, 2004. 12. Participated in the Seminar on public Art at Beijing Municipal Exhibition Hall, May, 2006. 13. Participated in Sculptural Camp organized by M.S.P.L. and Gallery Sumukha at Hospet (Humpi), Karnataka. 16. participated sculpture camp at north east organize by lalit kala academy kolkata. 1. 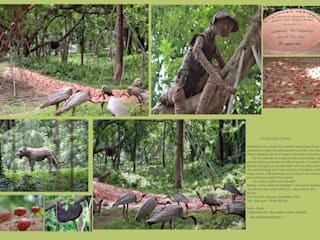 Site specific permanents Sculpture installed in Fort Raddison, Raichak, West Bengal. 2. Out door sculpture installed in Art Forest at Wien of Vienna in Austira. 3. Out door sculpture installed in Europos Parkas at Vilnus of Lithunania. 4. Out door sculpture installed at Institute for International Management & Technology, Bengal Campus, Oxford Brooker’s University. 5. 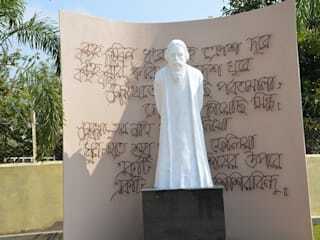 Site specific sculpture at Udayan, Bengal Ambuja Housing Development Ltd. Calcutta. 6. Ceramic Sculpture “Splendour” preserved at Modern Art Gallery, Faenza, Rome, Italy. 7. Out door - Sculpture (Lonely Planate) installed at Art in landscape Gut Gasteil, Prigglitz, Austria. 8. 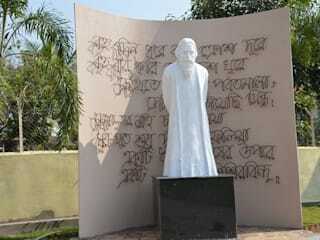 Permanent installation at “Swabhoomi” Heritage Plaza - Kolkata, December 2002. 9. Rashtriya Lalit Kala Academy, New Delhi, 2002. 11. 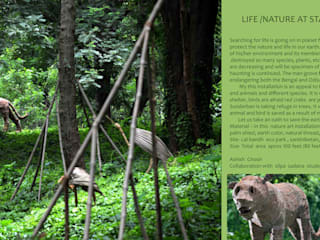 Site specific installation at E.M. Bye pass Kolkata. 12. A large installation at ‘URVASHI’ City Centre, Durgapur of Ambuja Housing Development Ltd.
13. Site-specific Sculpture at “ Simana” – A river side resort at Raichak. 14. Site specific sculpture at “Suravi” – A Resort on the Bank of the Ganges, 24-Parganas (S). 15. “LUGGAGE FOR MIGRATION” kept at the Museum of ARTRAGEOUS GROUP, NICOSIA, CYPRUS. 16. 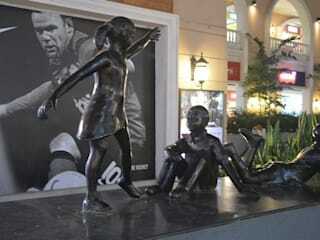 Sculpture “Crisis” permanently installed at Plaka in front of acropolis temple (perthanium) in Athens, Greece. 17. Permanent Collection at Krishnasayer Ecological Park. 18. “Unclaimed Luggage” Permanently install at circulo De Bellas Artes Museum, Madrid Spain. 19. “The Nest” installed at Beijing Municipal Hall. 20. “Gateway to Kanchanjungha” – A large site specific outdoor Sculpture installed at Uttarayan, Siliguri. 21. 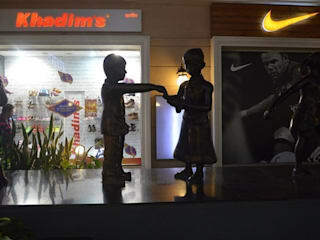 A number of outdoor City Sculpture permanently installed at Total township of new township and central Park – Uttarayan, Siliguri. 21. 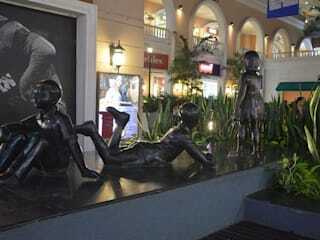 Several out door site specific Sculpture installed at city Centre, Kolkata. The Nest , Sonajhury pally.